Not all inventions are life-changers, but some of them are so simply clever that you can’t help but admire the ingenuity that went into creating them. Such is the case with the Morella, a simple little piece of plastic that means you can walk around outdoors, in the rain or snow, while carrying a drink or two and still have a free hand left over. The idea for the Morella came to the inventor, Ross, when he was in a pub in Wales and needed to step outside to make a phone call. He didn’t want to leave his drink inside, obviously, so carried it out with him. It was raining, so he tried to balance his drink on a ledge while holding his umbrella with one hand and his phone with the other. He never did get to finish that drink because it fell from the ledge and got smashed to bits. But it wasn’t for nothing; this was his eureka moment. 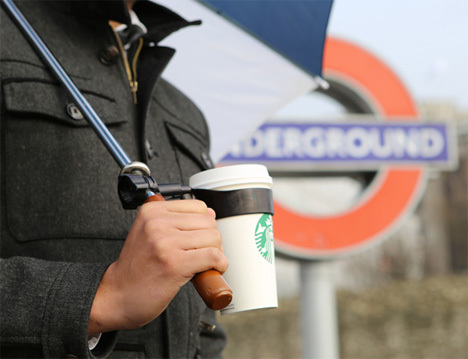 His invention is simply a cup holder that attaches to the handle of any umbrella. When your boss sends you on a coffee run in the rain, or your friend elects you to go fetch the beers at a festival, or you just really don’t want to carry that searing hot paper cup in the pouring rain, the Morella will be there to help out. The holder has a cool pivot system that ensures your drinks stay upright, even if you change the position of your umbrella. The inventor and his team started a Kickstarter campaign to get the product off the ground and onto umbrella handles in time for Britain’s always-rainy outdoor summer music festivals. See more in Various Gizmos or under Gadgets. March, 2014.